Homepage. This page: Day trips in the 1960s between Llandudno and Anglesey in North Wales. Ride on a Crosville bus & return by steamer! This single sheet promotional leaflet & timetable turned up in an old bookshop early in 2007, and looks like it dates to 1960. 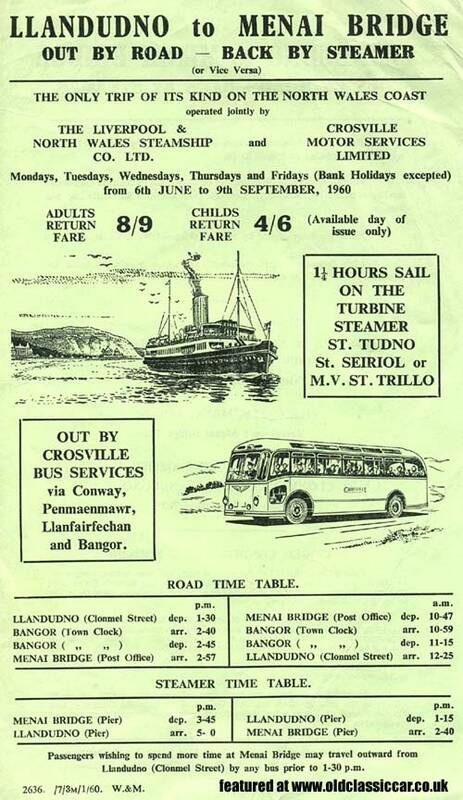 It advertised day trips between Llandudno and Menai Bridge. The outbound leg would be courtesy of a smart Crosville Motor Services single decker, and the return trip on a steam vessel operated by The Liverpool & North Wales Steamship Company Ltd. This service was set to operate from 6th June through to 9th September 1960. The fare was 8/9 for an adult, and 4/6 for each child, return. The outbound trip by Crosville would travel the scenic route via Conway, Penmaenmawr, Llanfairfechan and Bangor. I know these areas well, although many visitors to the area going to Anglesey would probably zoom by on the new A55, rather than take the slower, but much prettier, route given here. If anyone can tell me what bus or coach is shown in the illustration, I'll add it to this page. The trip back was altogether more exotic, courtesy of a turbine steamer ship - either the St. Tudno, St. Seiriol, or the M.V. St. Trillo. It's a shame that this service is no longer in operation, I think it'd be a fun day out! the sea journey lasted 1.5hrs giving you plenty of time to admire the North Wales coast. Departure was from Clonmel Street in Llandudno, arriving at Menai Bridge (Post Office) nearly 1hr 30 later. "This combined facility presents one of the finest and cheapest half day trips from Llandudno or Menai Bridge. Passengers travel to Menai Bridge or Llandudno by road on the regular services operated by Crosville via Conway, Penmaenmawr, Llanfairfechan and Bangor. Passengers return home by steamer along the Welsh Coast. Apart from the magnificent scenery the trip is a splendid tonic, the benefits of which will be enjoyed for days afterwards."